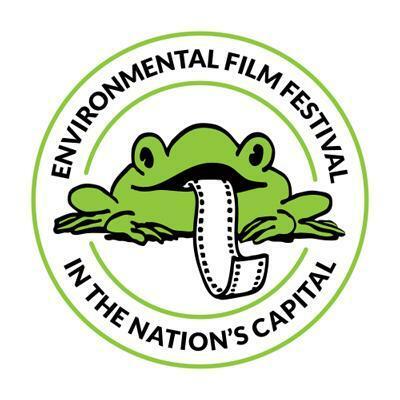 The Environmental Film Festival in the Nation’s Capital, March 15-26, is the largest and longest-running environmental film festival in the country and the largest film festival in Washington, DC. The 24th annual Festival presents over 140 films selected to provide fresh perspectives on a wide variety of environmental issues facing our planet. A special focus on “Parks: Protecting Wild” explores the vital role of parks and protected areas in our world. The 2016 Festival features cinematic work from 33 countries and over 70 Washington, D.C., U.S. and World premieres. Most screenings include discussion with filmmakers, environmental experts and cultural leaders. 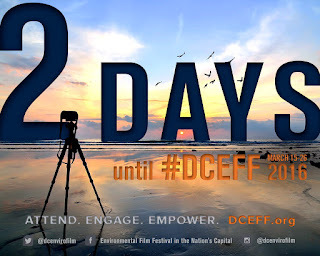 The complete Festival schedule is posted at www.dceff.org. A salute to the U.S. National Park Service Centennial, the new MacGillivray Freeman IMAX film, National Parks Adventure, explores our spectacular national parks, from Yosemite and Yellowstone to the Everglades, while An American Ascent documents the first African-American expedition to tackle Denali, North America’s highest peak, in Alaska’s Denali National Park. Jennifer Peedom’s new film, Sherpa, captures how Mt. Everest’s Sherpa community united in grief and anger to reclaim the mountain following a deadly avalanche in 2014. Oscar-nominated director Josh Fox (GasLand) will present his latest film, How to Let Go of the World (and Love All the Things Climate Cannot Change), exploring whether we still have a chance to stop the most destructive consequences of climate change. This film, which premiered at 2016 Sundance, is the winner of the Festival’s Documentary Award for Environmental Advocacy. Director Laura Dunn’s new film, The Seer: A Portrait of Wendell Berry, is the winner of the William W. Warner Beautiful Swimmers Award, established in honor of the Pulitzer Prizewinning author. The Polly Krakora Award for Artistry in Film goes to Eric Shirai’s The Birth ofSaké, a look at how world-class sake is made in Japan. Bluebird Man, a tribute to self-taught conservationist Al Larson’s efforts to save North America’s bluebirds has won the Eric Moe Sustainability Film Award, to be presented to filmmaker Matthew Podolsky, who shares the award with Neil Paprocki. Director Ian Cheney (The City Dark) will screen his latest film, Bluespace, an exploration of terraforming Mars, which makes a strong case for better stewardship of earth. Director Holly Morris will present her film, The Babushkas of Chernobyl about the women who return to live in the Chernobyl Exclusion Zone on some of the most toxic land on earth. Filmmaker and performance artist Laurie Anderson’s new film, Heart of a Dog will be screened. A retrospective of the narrative features of Kelly Reichardt is a major Festival highlight. 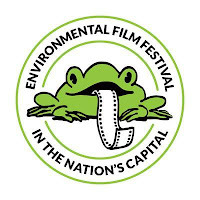 Featured among local films and filmmakers is the Washington, D.C. premiere of City of Trees by DC filmmakers Brandon and Lance Kramer about a green jobs initiative to plant trees in underserved parks in the city. D.C. filmmaker Sam Sheline screens the world premiere of his film, When Mickey Came to Town about Disney’s unsuccessful attempt to build an American History theme park in nearby Virginia. Local filmmaker Sandy Cannon-Brown presents the world premiere of her latest film, Beautiful Swimmers Revisited, an update on the Atlantic blue crab in the Chesapeake Bay. Virginia filmmaker Rebecca Wingert-Jabi shows Another Way of Living, her film about the creation of the utopian suburb of Reston, Va. Local filmmakers Aditi Desai and Vanina Harel screen the world premiere of The Culture of Collards, exploring the African-American cultural heritage of collard greens. Longtime D.C. filmmakers Hal and Marilyn Weiner present the world premiere of Dispatches from the Gulf, a frontline report on efforts to mitigate the impact of petroleum pollution from the 2010 Deepwater Horizon oil spill. Director Jon Bowermaster will screen After the Spill, evaluating the lingering impact of the event on the people of the Gulf. He will also show the world premiere of his new film, Dear President Obama, Americans Against Fracking in One Voice. Oscar-winning French director Luc Jacquet will return to the Festival with his film, Ice and the Sky, uncovering evidence of climate change in the glaciers of Antarctica 60 year ago. Science films also encompasses winners from the Jackson Hole Wildlife Film Festival, including License to Krill about the decline in the essential food of marine animals; Sky Line, tracing progress in the dream of building an elevator into space; and The Creeping Garden, an investigation of the wonders of plasmodial slime mold. Wildlife films include Blood Lions about lions bred in South Africa to be shot for sport; Puffin Patrol, showing what this bird, found on north Atlantic coastlines, can tell us about the dangers facing our natural world; Monkey Kingdom, exploring the world of Sri Lankan monkeys; Tiny Giants 3D, showing the challenges faced by miniature forest animals; Life Story: First Steps, in which David Attenborough captures the initial forays of baby animals into the world. Films from Latin America include Chilean documentarian Patricio Guzman’s The Pearl Button, an award-winner from the Berlin Film Festival, illuminating the intersection between the waterways of his country and its history; the award-winning Mexican film, Kings of Nowhere, about resilience in the face of a flood; and three films from the Dominican Republic Environmental Film Festival highlighting the natural beauty of that island nation. Built and created environments are explored in Troublemakers, a look at the land art movement of the 1970s; An Art That Nature Makes, profiling the work of Rosamond Purcell; and The Salt of the Earth, showcasing the arresting environmental photography of Sebastião Selgado. The 2016 Festival will include the largest number of women filmmakers participating in its 24-year history. More than 60 percent of films being screened are the work of women filmmakers, including a Festival award winner, an opening night film and several world premieres. Presented in collaboration with over 100 local, national and global organizations, the Festival is one of the largest cooperative cultural events in Washington, D.C. Films are screened at 52 venues throughout the Washington metropolitan area, including museums, embassies, libraries, universities, and local theaters in all eight wards of the city. Some 70 percent of film screenings are free. For the complete schedule, visit the Festival website, www.dceff.org and find us on Facebook, Twitter and YouTube.